I arrived early at Richard's office and he was about to take a phone call interview with a reporter from Brazil. He had recently come back from a trip to the 2nd International Conference on GPLv3 in Porto Alegre, Brazil. Richard was pleased with the sign, even though only a few supporters were able to come to the speech. News of the event came late and we were only able to get an alert to our supporters at the last minute. One of them, Chris, had never been to an FSF event before and this would turn out to be an interesting introduction. We headed to the lounge where people were already gathering for the speech. Richard had prepared some handouts for the audience, which he immediately started giving out. He gave the signs to a fellow supporters in the audience. The assistant to the faculty member in charge of organizing the event came over and asked Richard to stand outside the room, away from the people gathering for the speech. He, of course, refused to leave as it was his right as a member of the public (and even more his right as someone with an office in that very same building!) to be there. He informed her that he had no intention of disrupting the speech. The sign, he said, was loud only visually and would not disturb anyone listening to the speech. The organizer's assistant, who was clearly frustrated and had left briefly and come back, was standing in the way of the sign. (I would soon learn that she had briefly left to make a phone call.) I asked her politely if I could take a picture of Richard and the sign he was now holding. She said she would prefer to be in the picture with Richard. I did not catch the frustration in her voice as she steadfastly blocked my camera's view of the words on the sign. The speech started, and as promised, Richard did not interrupt it. He continued quietly handing out leaflets to those who would take them. 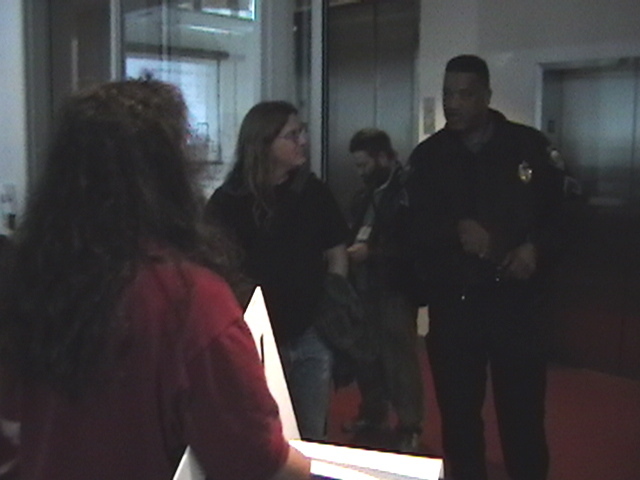 I looked to my right, near the entrance to the lounge where the speech was taking place, and there were two of MIT's police force, taking notes from the faculty member and his assistant. Then there were three police. Then four. And then a plain clothes detective. A very tall, very large police officer quietly asked Richard if he could come outside so that he could ask some questions. Richard, again as is his right, said no, which escalated the officer's response. He took Richard by the upper arm and Richard loudly asked if he was being arrested -- he didn't know why the officer was grabbing him. The officer pulled more and Richard yelled more. "Am I being arrested?" he asked. This got the attention of everyone in the audience and stopped the speech momentarily. The officer took Richard outside the room and the faculty member, his assistant, and some other people I didn't know were there. The officer who had taken Richard by the arm then questioned the faculty member about why the police had been called. They had been told that there was a disturbance that they needed to take care of. The officer then asked what the disturbance was and the faculty member relented - they were worried that there would be an incident, but that it hadn't yet happened. The officer did not like this answer, but asked the organizer if it was ok if Richard stay as he was doing nothing wrong. They said yes, as long as he agreed to sit (there were many standing people in the audience and they were all told to sit by the officers because of the fire hazard). Richard agreed to those terms and took a seat near the entrance of the event. He held up his sign for the entire speech, while Chris passed out Richard's handouts to late-comers. 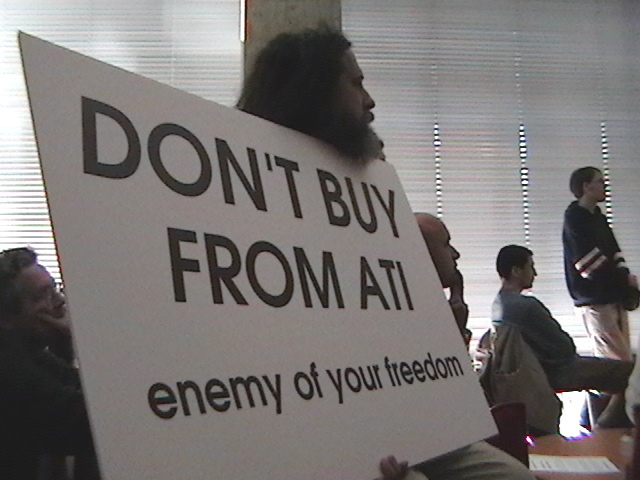 It's important that we don't allow ATI and NVidious to feel comfortable about the way they mistreat our community. (See this interview with RMS on ZNet for more on this issue.) We should be equally critical of any company that acts this way.